This week’s Telegraph column, with some handy visual aids. Morning, everyone. Sorry if I don’t make much sense this week. I’m quite tired. Haven’t been sleeping. 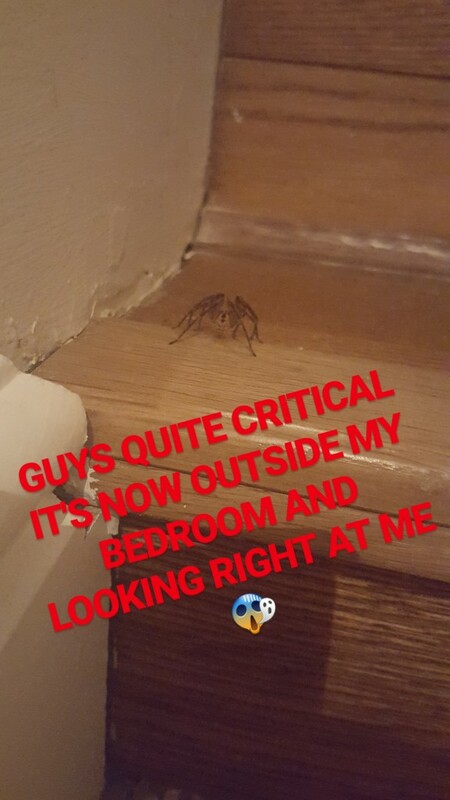 Had a spider in my flat. And when I say a spider, I don’t mean one of those piddly little ones the size of a ladybird. I mean a creature that looked like something from a Greek myth. Half spider, half horse. 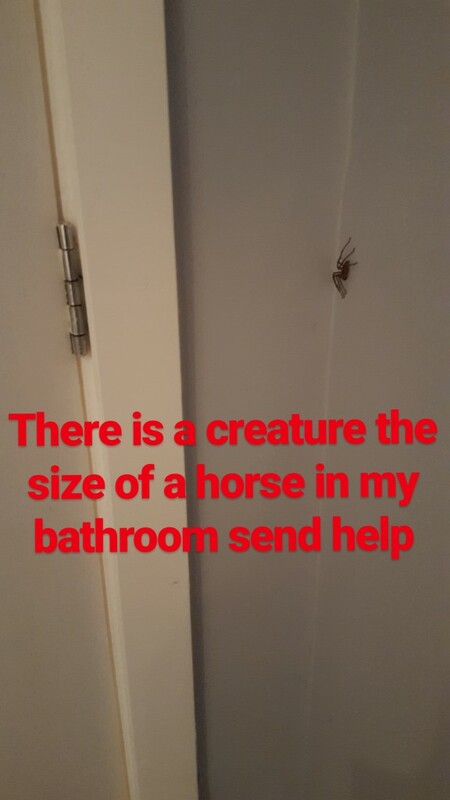 I could practically have saddled the hairy, eight-legged freak and ridden it to work. I can’t now though because it’s dead. After several days of dancing around one another – the mini minotaur crept from my bathroom, to the stairs outside my bedroom, to a patch of carpet right outside my bedroom – I found the biggest book I owned and dropped it on of it. Sorry, Bill Oddie. Enough was enough. 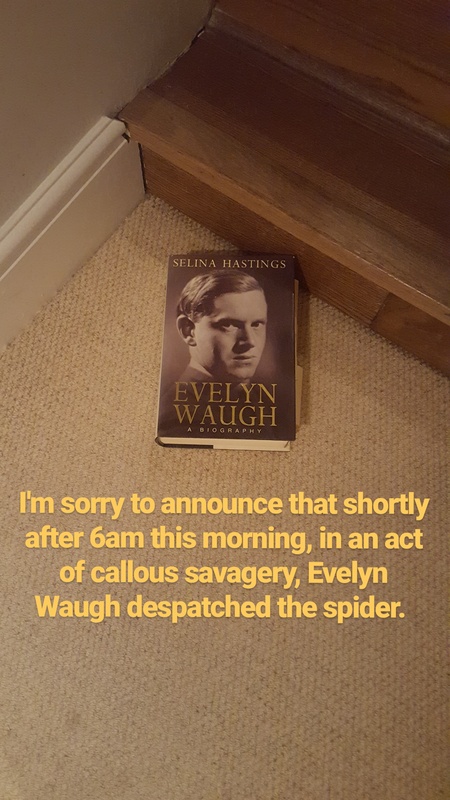 The book in question was Selena Hastings’ biography of Evelyn Waugh and I haven’t been able to move it since because of the spider corpse underneath, so a young, slightly cross-looking Evelyn is still gazing up at me from the floor. Which brings me to the point – can I leave the book there for my cleaner to deal with or not? What is it acceptable to ask your cleaner to do, and what is wholly unacceptable? My nice cleaner Iwona comes every Monday, so before I leave for work I remove my earplugs from my bedside table and hide them in my knicker drawer because I feel it’s a bit much for her to have to touch or even look at what resembles a pair of brown, shrivelled raisins. There is usually, however, a pile of washing up in my kitchen sink which she deals with. My dad disproves of leaving washing up for the cleaner. He used to insist we washed up everything before our cleaner came, as if leaving out a smeary plate was rude but leaving out a pile of boxers to be ironed was not. Priorities, I suppose. I carried out some top research on this topic by quizzing a couple of colleagues. It’s absolutely fine to ask a cleaner to dust, mop, make beds and pick up 462 pizza leaflets from the door mat, they decided. But overflowing ashtrays you have to deal with yourself, said one. And it’s feral to leave a grubby loo for them, said another. ‘I pick my dirty clothes up from the floor and put them in the laundry basket for her,’ said someone else, quite proudly. Not quite Jesus sacrificing himself on the cross but there we go. Course there can be language barriers which make it even harder for Brits already crippled by social anxiety at the thought of having to ask someone to clean up after them. If your cleaner is Polish, say, and speaks no English, then not only do you have to ask her (or him, we’re not sexist here), to dust the top of the television, you might even have to mime this dusting action for her (or him). And you end up feeling a bit Basil Fawlty. Perhaps the general rule of thumb should be ‘Would you be ashamed if a friend saw this?’ If you’ve left dirty socks all over your bedroom floor or used teabags on the kitchen counter (guilty), then maybe have a quick whip-round, chisel the socks from the floor, lob the teabags in the bin and so on. 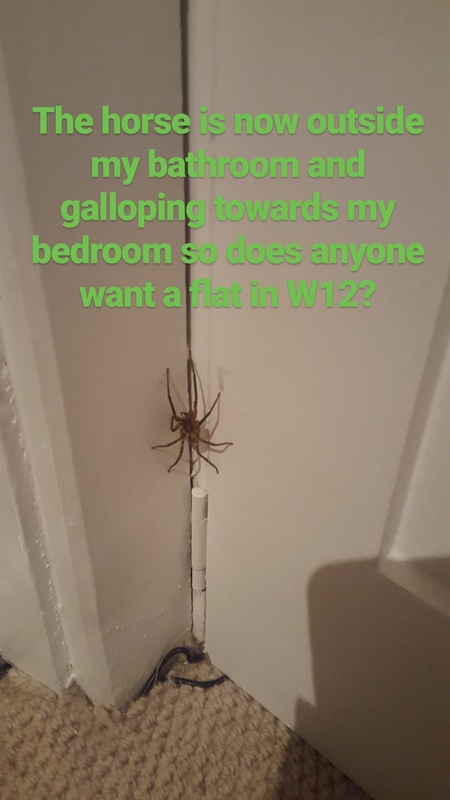 As for the spider, I emailed the owner of the cleaning agency to see if Iwona was arachnophobic or not. If she is, I wrote, then I will get rid of the book. ‘If she isn’t, then I might just leave it there for Iwona on Monday morning, if that’s alright?’ At the time of writing, I hadn’t heard back. So Evelyn Waugh is still lying on the floor and, I must say, he’s looking fairly peeved about it.